IEEE/ASME Advanced Intelligent Mechatronics (AIM), Munich, Germany, 2017. 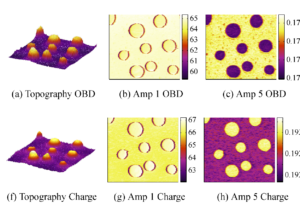 A major difficulty in multifrequency atomic force microscopy (MF-AFM) is the accurate estimation of amplitude and phase at multiple frequencies for both z-axis feedback and material contrast imaging. 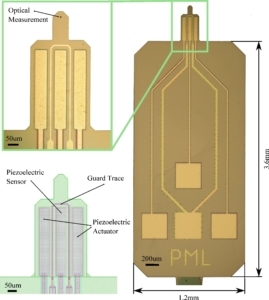 Typically a lock-in amplifier is chosen as it is both narrowband and simple to implement. 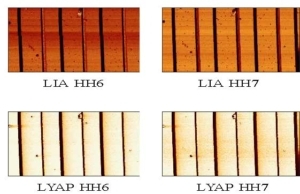 However, it inherently suffers drawbacks including a limited bandwidth due to post mixing low-pass filters and the necessity for multiple to be operated in parallel for MF-AFM. 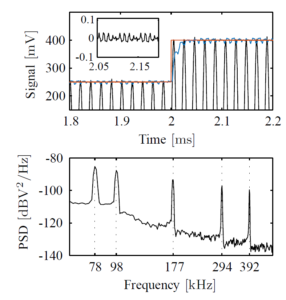 This paper proposes a multifrequency demodulator in the form of a modelbased Lyapunov filter implemented on a Field Programmable Gate Array (FPGA). 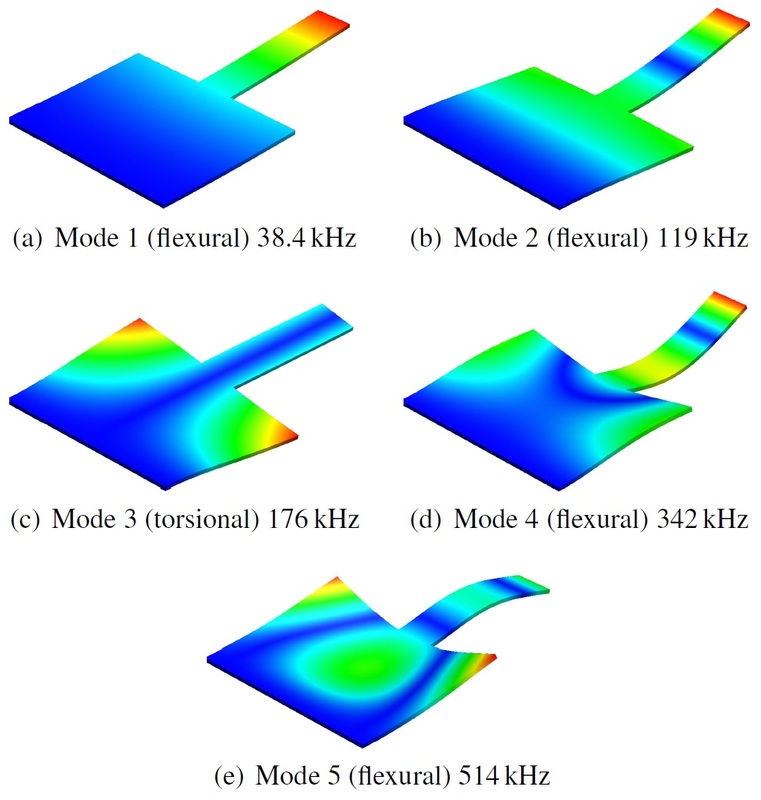 System modelling and simulations are verified by experimental results demonstrating high tracking bandwidth and off-mode rejection at modelled frequencies. 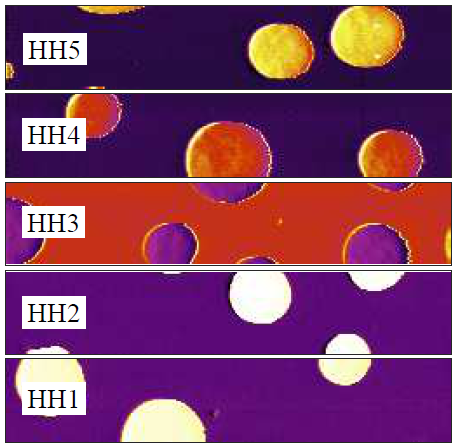 Additionally, AFM scans with a five-frequency-based system are presented wherein higher harmonic imaging is performed up to 1 MHz. IEEE/ASME Transactions on Mechatronics, 21 (6), pp. 2705-2715, 2016. 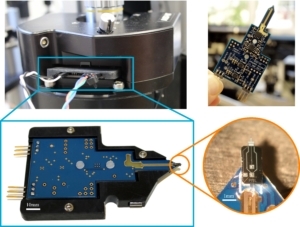 Emerging multifrequency atomic force microscopy (MF-AFM) methods rely on coherent demodulation of the cantilever deflection signal at multiple frequencies. 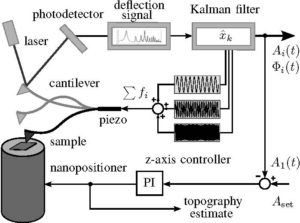 These measurements are needed in order to close the z-axis feedback loop and to acquire complementary information on the tip-sample interaction. 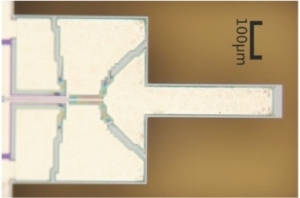 While the common method is to use a lock-in amplifier capable of recovering low-level signals from noisy backgrounds, its performance is ultimately bounded by the bandwidth of the low-pass filters. 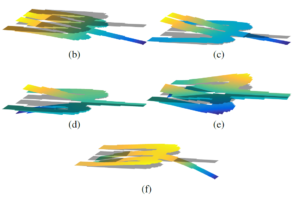 In light of the demand for constantly increasing imaging speeds while providing multifrequency flexibility, we propose to estimate the in-phase and quadrature components with a linear time-varying Kalman filter. The chosen representation allows for an efficient high-bandwidth implementation on a Field Programmable Gate Array (FPGA). 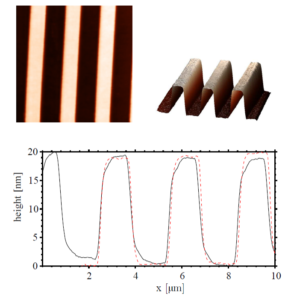 Tracking bandwidth and noise performance are verified experimentally and trimodal AFM results on a two-component polymer sample highlight the applicability of the proposed method for MF-AFM. American Control Conference, pp. 2617-2622, Boston, MA, USA, 2016. 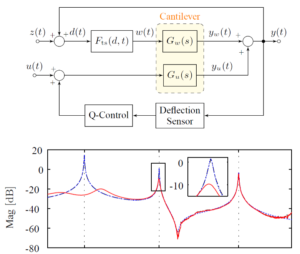 A fundamental component in the z-axis feedback loop of an atomic force microscope (AFM) operated in dynamic mode is the lock-in amplifier to obtain amplitude and phase of the high-frequency cantilever deflection signal. 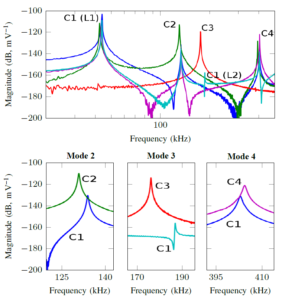 While this narrowband demodulation technique is capable of filtering noise far away from the carrier and modulation frequency, its performance is ultimately bounded by the bandwidth of its low-pass filter which is employed to suppress the frequency component at twice the carrier frequency. 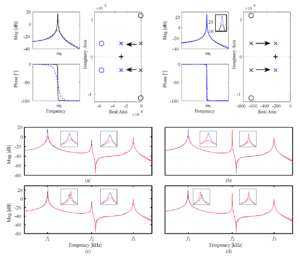 Moreover, multiple eigenmodes and higher harmonics are used for imaging in modern multifrequency AFMs, which necessitates multiple lock-in amplifiers to recover the respective amplitude and phase information. 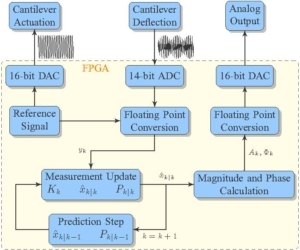 We propose to estimate amplitude and phase of multiple frequency components with a linear time-varying Kalman filter which allows for an efficient implementation on a Field Programmable Gate Array (FPGA). 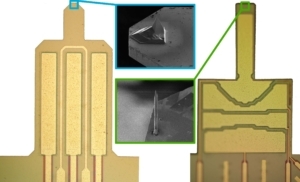 While experimental results for the single mode case have already proven to increase the imaging bandwidth in tapping-mode AFM, multifrequency simulations promise further improvement in imaging flexibility.